Miniature and Subminiature Lamps have advantages and should be considered by the design engineer for those applications requiring higher light output or higher temperature operation than is available from Light Emitting Diodes (LEDs). Another advantage is their broad band spectral emission, which extends from the visible to the infrared. Miniature and Subminiature Lamps specified in this catalog are listed by ANSI and MIL standard part numbers. Specifications for each lamp meet or exceed the parameters specified for the lamp number. These miniature and subminiature lamps are specified for current, brightness and life at their design voltage. The lamp may be operated at voltages other than design voltage. This variation is called operating voltage. An operating voltage higher than design voltage will result in increased brightness with a decrease in rated life. Rated life may be increased with a decrease in design voltage. Please see the Rapid Lamp Calculator Diagram (Halogen Lamp Technical Discussion). Design current, measured in amps, is the current flowing through the lamp filament when op­erated at the design voltage. Normal tolerance for design current is ±10%. Total luminous flux of miniature and subminiature lamps is measured using an integrating sphere and other instruments and standards with calibration traceable to NIST. Mean Spherical Candle Power (M.S.C.P.) are lumens per steradian and lumens are units of total luminous flux into the full 4n steradians of solid angle for a sphere. Standard miniature and subminiature lamps in this section have been selected to a brightness tolerance of ±25%. When required, these lamps may be selected to a closer brightness tolerance of ±15%, ±10%, or ±5%. Rated life as specified in the Standard Miniature and Subminiature Lamp section is expressed in terms of hours. Rated life is calculated at design voltage, with alternating current and under ideal laboratory conditions. In actual use, lifetime may be shortened as a result of hostile environments such as shock, vibration, and extreme temperatures. Life may be substantially increased by selecting an operating voltage less than the design voltage. This decrease from design voltage will also result in a cooler filament providing increased resistance to shock and vibration. 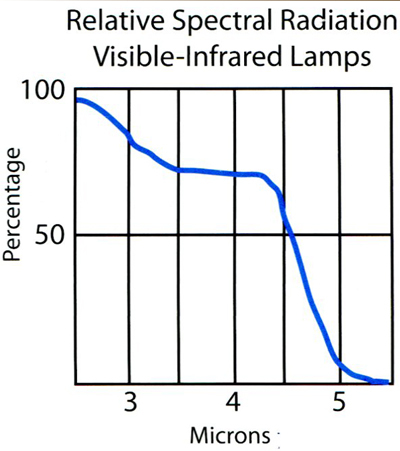 Subjecting miniature and subminiature lamps to a burn-in period will improve the stability of light output over time. It is possible to do an ac­celerated burn-in for these lamps by running them for a specified time at a carefully controlled voltage greater than their design voltage. Our T-3/4 and T-1 Visible/Infrared lamps are designed for applications requiring wide spectrum emission, such as gas sensing and detection. These miniature and subminiature lamps are made with a rugged, compact CC-6 filament that con­centrates infrared energy into a small point. The thin glass envelope results in minimum infrared absorption. Peak energy of these lamps occurs at 1.4 microns and extends beyond 4.0 microns. The visible / infrared lamps have been designed for long life and can be supplied with standard wire leads, a bi-pin base, or in an assembly.